Thanks to you, it has been a wonderful year for the mission. The work has been backbreaking, but the rewards have been great, and as we look to the future, we thank the Lord for your prayers and your financial support. A blizzard November 19th brought the season's first two- and three-foot snowdrifts to our transmitter site, ending the chance for our emergency generator building to be completed before winter, which is already in full force! And so, we will weather another winter without emergency backup power at our remote tower site. However, when things thaw in May or June, we'll be poised for the three or four warm days we need to complete the installation. Thank you again for your help this past year. Please hang on with us! Full Size SITTING DOWN ON THE JOB: In June and July, volunteer Linda Raab spent days sanding copper ground strap and wire, helping Tom Busch and Les Brown, who spent days with their knees in the dirt, using gas torches to solder thousands of grounding connections. 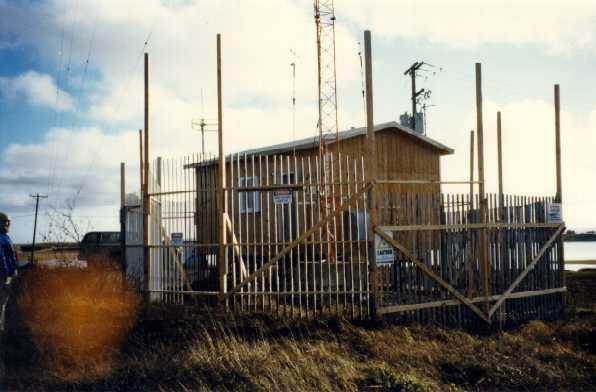 The new transmitter building was surrounded on all six sides by a screen shield. It was a construction detail that added about $3,000 and about 250 hours of work. We're grateful for knee pads! INSPIRATIONAL SPOT: Between the great things we cannot do and the small things we will not do, the danger is that we shall do nothing. 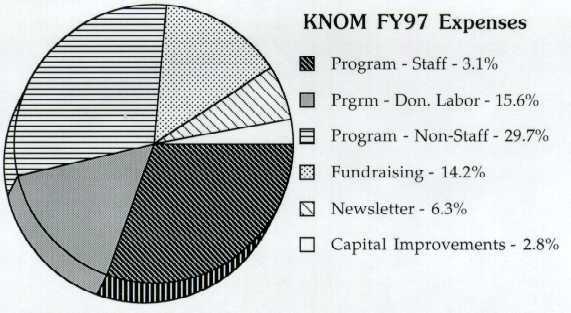 top Here is a summary of KNOM finances, for the year ending June 30, 1997. To ensure a more realistic picture, we add $120,000 to both income and expenses under the label "Donated Labor." 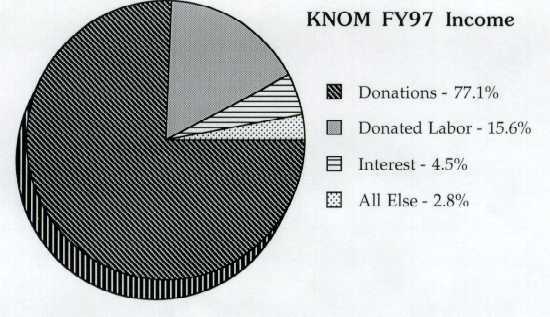 This represents the additional money which the KNOM staff would cost if they were paid typical wages for the work, and represents a de facto donation by the staff. "Interest" is high for the period, as building fund contributions had been received, but not yet spent as of June 30th. "Fundraising" represents all costs associated with acquiring new donors. "All Else" includes income from sources such as book and T-shirt sales, tower site rental to the National Weather Service, and program underwriting. "Capital Improvements" represents a net "profit" for the year, all of which was dedicated to the new transmitter building fund. Total cash income for the period: $648,020. Total cash expenses: $617,244. If you'd like a complete income/expense sheet for FY97, or any other period, please write KNOM general manager Tom Busch and he will be happy to send it along. You can see from the income chart how vitally important your contributions are to the mission. Without your faithful support, our award-winning service would not be possible. Thank you for keeping our mission radio station alive and active! INSPIRATIONAL SPOT: It is a very great poverty to decide that a child must die that you might live as you wish. As we headlined on page one, that glitch due to a small goof at the FCC has been eliminated, and at press time, engineer Jack Mullaney and lawyer Christine Simpson were preparing the paperwork for Bishop Mike Kaniecki, SJ to sign for our final 25,000 Watt license. We're headed toward the higher power by the end of the year -- hurray! 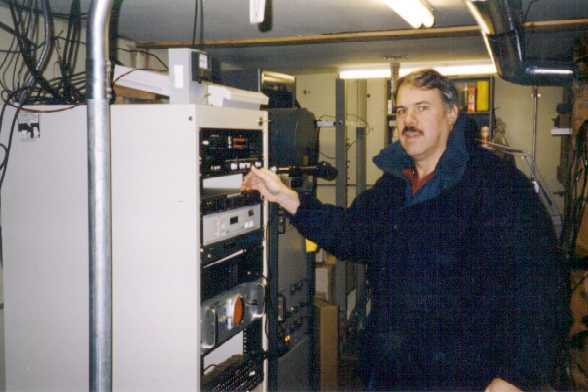 THE OLD: In a photo taken earlier in the year, Ric Schmidt stands inside the old transmitter building, you can see not only the cramped nature of the building, but also the bowed ceiling, as the 1960’s highway construction shed was beginning to crack apart. 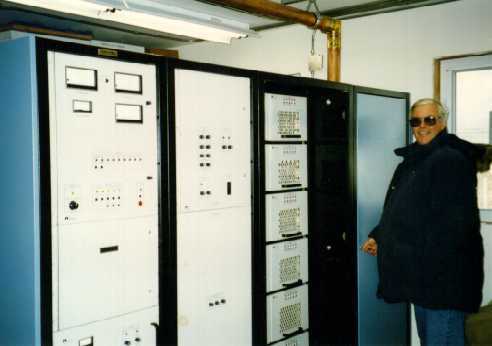 AND THE NEW: Manager Tom Busch poses alongside the new Nautel 25,000 Watt transmitter inside the new building. Thanks to you, this bright, safe, solidly-built structure will provide a reliable home for the KNOM AM transmitter far into the distant future. Engineers are scratching their heads as to why, when we transferred to the new building August 16th, our signal became audibly louder in villages, even at the same power. Thank you, Lord! That in His Mercy I be judged as big enough to keep. AWARDS: Yes, 1997 was an incredible year of recognition for your mission radio station. We were honored not only by a second-in-a-row "Radio Station of the Year" Gabriel Award, but also by the Alaska Broadcasters Association's "Community Service Award," putting us at the top of all radio and television stations in the entire state. General Manager Tom Busch was inducted into the Alaska Broadcasters Hall of Fame, and other accolades went to our entertainment programming and public service announcements. We gratefully share these honors with you. GET THE DRIFT? We sure hope that snow will blow completely through the new tower fence built by Les Brown (shown here in October). But if it decides to pile up as in the past, we'll string the 16-foot posts with rope to keep away the curious. Snow has drifted to a height of about 14 feet in past years. INSPIRATIONAL SPOT: Unless we find beauty and happiness in our backyard, we will never find them in the mountains. top RECEIPT: At IRS direction, we routinely send receipts in response to every contribution of $250 or more; in the third week of January, we'll also send a receipt to every contributor who has donated a total of $250 or more during 1997. If you gave less than that but would like a receipt, please write and we'll be glad to send you one. We deeply appreciate your support. 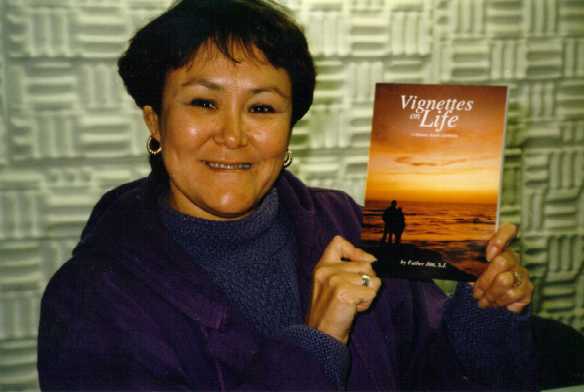 Our mission is on the air to spread God's Love throughout dozens of remote Eskimo and Athapascan Indian villages, scattered over unimaginable distances. 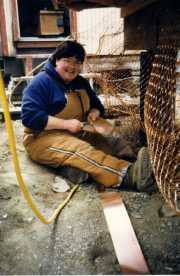 24 hours a day, we fill the Alaskan airwaves with inspiration, news, education and companionship. Our programming inspires the heart and battles the region's many crippling problems, the epidemic sexual abuse and family violence, alcoholism, suicide, rampant illnesses like hepatitis and tuberculosis. Your tax-deductible contributions to KNOM join this long standing effort of the Catholic Church. On behalf of our thousands of remote listeners, thank you for your generosity and your prayers during 1997. And please continue with us as we press into 1998. May God bless you!